Thank you for visiting Scottish Transom Stained Glass Gallery. We invite you to browse this small sample of our transom window selection. 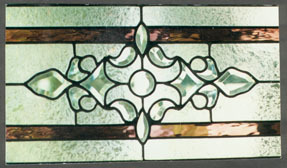 Transom stained glass can add beauty and privacy to both exterior and interior windows. We often add stained glass to transom windows in bedrooms and the second story of living rooms and family rooms to add privacy for a home owner. In dining rooms and kitchens, stained glass transoms windows can add a touch of color and some individuality to a home. Often these designs are base around leaves, grape clusters, or other “natural” inspirations. Transom windows above entryways are also another popular option. 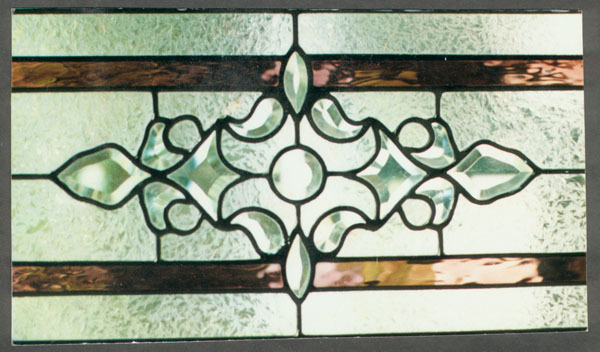 In these cases the transom stained glass often matches any glass that was added to the entryway sidelight and door. Stained glass transoms are also popular on the interior of a home. We very often add stained glass windows to the glass area that exists above many of today’s door installations. Follow this link to learn more about our stained glass transom choices or contact us today for a free consultation.